As they rapidly develop, many cities around the globe continue to clear urban forests for grey infrastructure. Indeed, roads, buildings and other parts of the built-environment are absorbing volumes of urban greenery, as trees and grass often lack priority within urban planning. As a result, trees are disappearing from urban and peri-urban regions. Local and regional decision makers must strive to balance development with sufficient urban forests, and see them not as a contrasting features, but as complementary elements necessary for healthy living. Indeed, as research shows, a hallmark of a sustainable city is the integration of green and gray infrastructure. More specifically, there are a multitude of benefits for cities that include trees in their landscape, including improved health and quality of life, a reduction in air pollution, carbon sequestration and a decrease in the urban heat island effect. In sum, urban forests benefit the environment, quality of life and the economy of cities. Launched by the Mayor of Surabaya, Tri Rismaharini, the “One Soul One Tree” campaign sponsored 5,000 trees by individual citizens in an effort to prevent them from being cleared. Moreover, the initiative encouraged and taught citizens how to utilize the mangrove trees as resources, using them to harvest syrup, batik (a craft material) and other products. This measure not only provided locals with new skills and means of income, but ensured that the mangroves would be maintained by the Surabaya community. The campaign is only one piece of the mayor’s overall local policy portfolio, which focuses on transforming open, barren spaces into green areas by creating city forests and building green islands along roads. A 2014 nominee for World Mayor Award, Rismaharini’s active and hands-on approach for creating urban forests has helped revitalize the area. Once a gray industrial region, Surabaya is now famous as the vibrant “million park city,” where citizens enjoy a high quality of life and improved economic opportunity. Surabaya and its mayor make clear how critical local leadership is in building more sustainable urban environments. Aside from the top-down, policy based approach for preserving urban greenery, residents can also lead to create green spaces in their communities. Consider, for example, the residents from Vasant Vihar—a neighborhood in New Delhi, India—who successfully came together to save the declining number of trees in their community. The movement was started by Vallari Sheel and Aditi Veena, who noticed that trees were being cut overnight by developers. Taking action, Sheel banded together community members to monitor the trees, and proposed giving each tree an identity through a “Tree Census.” Under this program, each tree is given a unique number and entered into a database with additional identifying characteristics so residents can keep track of the tree population. The tree census, pioneered by Sheel and Veena in Vasant Vihar, had full support of the Resident Welfare Association of Vasant Vihar. With institutional backing, nearly 2,500 trees now stand tagged and protected. Further, the tree census comes at a critical time, as air quality and pollution levels in Delhi reach dangerous levels and require measures to improve the environmental health of the city. 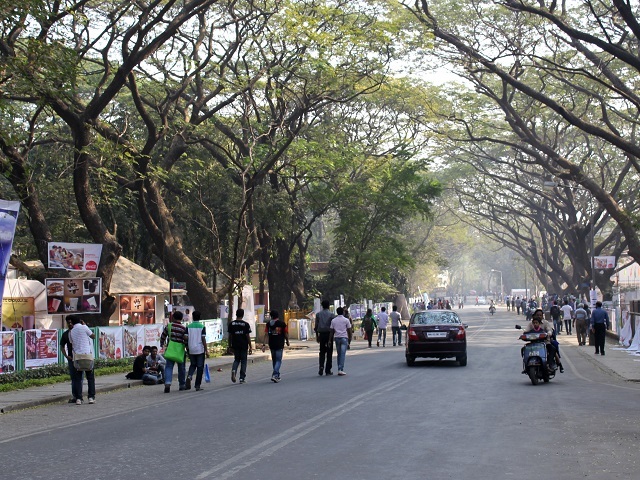 Similar community programs for tree preservation are also emerging in other Indian cities like Mumbai, India—but they often lack government support. Studies have shown that green space make citizens happier and healthier—yet they’re too often the first areas to be sacrificed for urban development. It’s time we take a note out of Surabaya and Vasant Vihar’s book and fight back to save our urban forests.